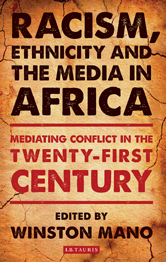 This book sets about rethinking the role of media and communication in perpetuating, reinforcing and undermining racism, ethnicity and other discriminations across Africa. It goes beyond customary discussions of representation of racism and ethnicity to question the role played by specific media institutions. Topics and issues covered include racism in South African newspapers, pluralist media in Kenya, media discourses on homosexuality in Namibia, and the politics of African News in Nigerian newspapers.